We were very privileged and honored to receive an invitation from Mandara Spa which celebrated their 20th Anniversary to learn and experience traditional Balinese energy healing session. We took a sweet stroll that was filled with lush greenery that surrounded the beautiful path towards Mandara Spa. My pampering journey had already started! 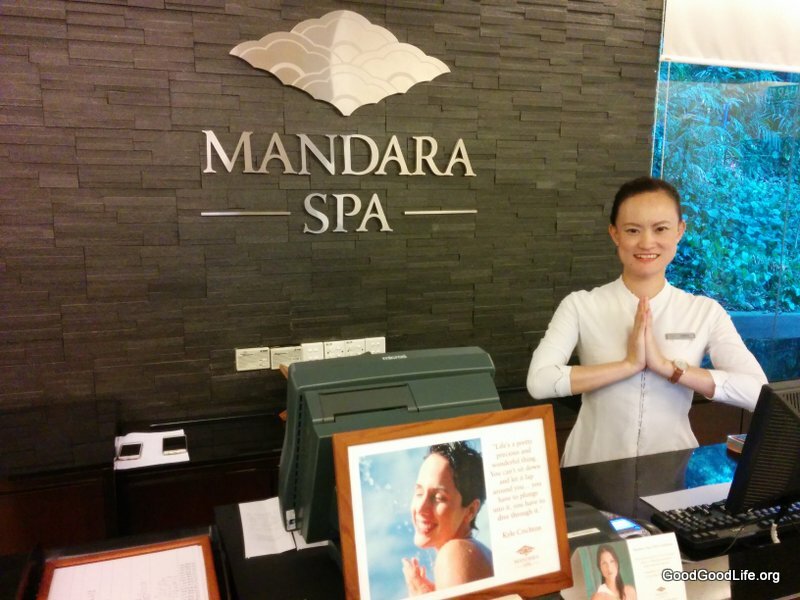 Upon arrival, we were greeted by cheerful and friendly staff at the Mandara Spa and I immediately felt like I was on a holiday in Bali. We were served cold ginger tea and a peppermint cold towel which was so refreshing and thirst quenching. I was rather surprised to find out that the session was to be conducted by a Guru who specially flew in from Ubud, Bali, as part of his world tour journey, just to share with us this one hour session and his traditional yoga breathing technique. Guru Made Sumantra came from a family of traditional Balinese healers (Balian). He inherited this art of healing which is a tradition and knowledge in which was passed down generation to generation. Having very little knowledge and experienced about yoga I was very curious to learn more about this energy healing session and wanted to know how it can really help me unwind and de-stress in this fast moving world we lived in. During this precious one hour session with Guru Made, the traditional Balinese energy healing session was rather different from the yoga I have heard and seen. Guru’s session was focused on the art of breathing. During the session, I could feel the energy flow throughout my body. Starting from my head and ending with the tinkling sensation all the way to my feet. During this session, Guru Made was very effective by guiding us on how to focus on our breathing and to feel the energy and to let it flow within my entire body. Even though the focus is on breathing, it was also coupled with some simple stretching exercise which was very effective in making me calm and relax. I could feel my stress of my stiff shoulders ebbing away and I was able to feel light after just a 60 minute session. Mandara Spa is a lovely place to visit should you need pampering and offers a wide range of treatments. Do call and make arrangements for the wonderful and blissful experience. This entry was posted in Beauty, Health and tagged balinese, breathing, energy healing, Guru Made, Mandara Spa, meditation, rejuvenation, relaxation, Resort, spa, yoga by Miss P. Bookmark the permalink.